Overview: June 2010: Flying Colors is a brand new 20-line, 5 reel video slot. 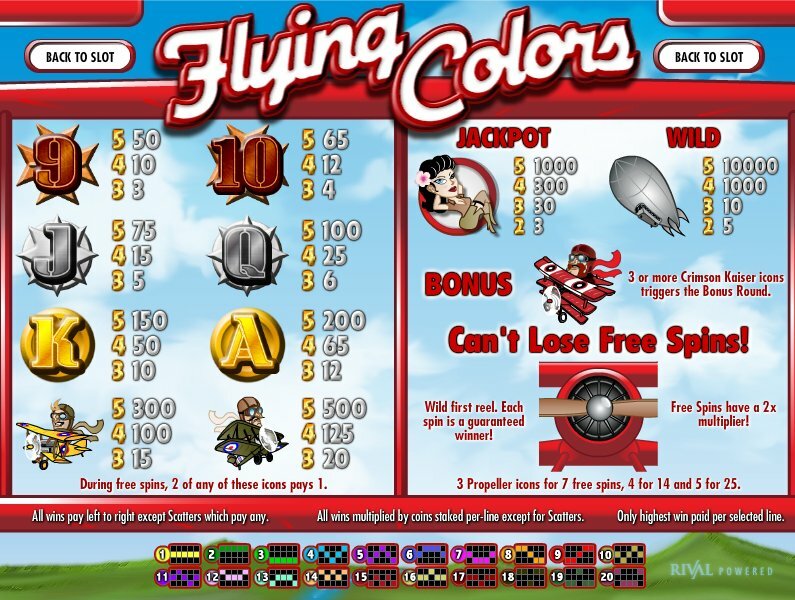 Flying Colors is an aerial themed WWI slot, highly decorated with medals of bravery and triumph. Surrounded by zeppelins dropping bombs and enemies. 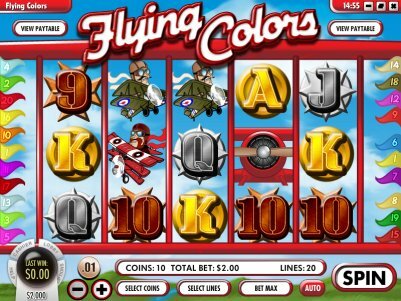 A main special aspect of Flying Colors is a can't lose free spins feature. For the duration of the free spins, the first reel will always be wild and additional 2-icon payouts will be added to the paytable. The end result of this is that all big wins will be easier to achieve, and you will win at least your original bet back for each spin. If 3 or more Crimson Kaiser (Bonus) icons appear anywhere on the reels, you will be taken to the Flying Colors Bonus Round! Follow the instructions on screen, once the bonus round is complete normal slot play will resume. Other special features include a huge 10,000 coin jackpot offering higher pays and graphics wise, an enhanced WW1 aerial dogfight bonus round which pits you against an unknown total number of enemies in aerial combat. The more kills you get, the more you win. Similar Slots: If you like Flying Colors, you might like these other Rival video slot machines: Candy Cottage, Fast Lane, Lion's Roar, Silver Unicorn, Wheel of Cash.